The boss of one of the world’s largest cigarette companies has urged Britons to stop smoking. Peter Nixon is the UK managing director for Philip Morris, which produces 800 billion cigarettes across the world every year. But today, on National No Smoking Day, he appeared on ITV’s Good Morning Britain to implore smokers to switch to his new heated tobacco products – claiming they are less harmful. He was ridiculed by hosts Piers Morgan and Susanna Reid who compared his scheme to ‘McDonald’s selling salad’ and branded it ‘a joke’. Mr Nixon admitted smoking is bad for you and that his firm’s products contribute to 100,000 smoking-related deaths in the UK every year. He told the programme: ‘People die because of cigarettes and we sell them. I take that very, very seriously. 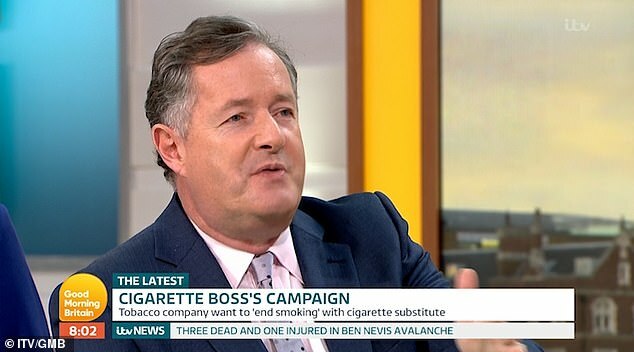 The cigarette boss also admitted he has given up smoking, which led presenter Susanna to brand his campaign ‘staggeringly hypocritical’. Grilled on why Philip Morris doesn’t just stop selling cigarettes altogether, he claimed that would not lead to people giving up smoking – and would just see them switch to another brand. He also refused to reveal his annual salary, which he says is less than £1million, claiming it was ‘unfair’ to expect him to do so on national television. But he added that his annual bonus is dependent on the number of smokers he can get to switch to alternative tobacco products per year. He said: ‘I’d love to stop selling cigarettes. But we would go out of business and that wouldn’t mean people give up they would just switch to another brand. 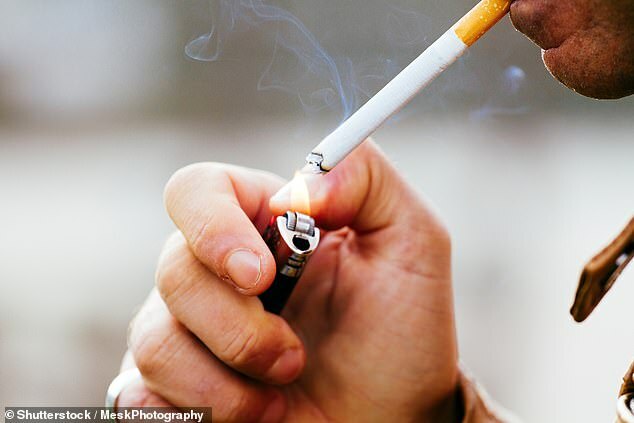 ‘There are going to be smokers in the UK for another 30 or 40 years, but there’s no reason for people to smoke anymore. 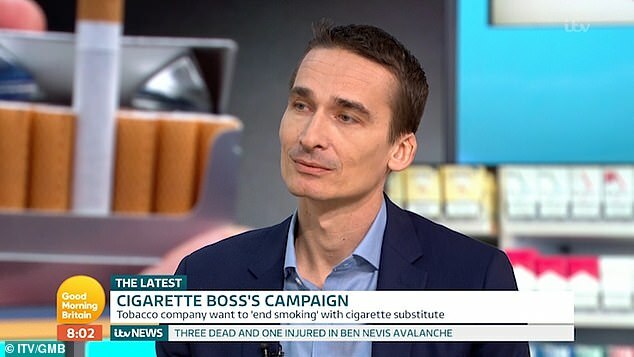 GMB health editor Dr Hilary agreed that vaping is less harmful than smoking cigarettes, but Philip Morris’s heated tobacco products still have toxins that are dangerous and nicotine, which is addictive. Mr Nixon claimed that after offering consumers E-cigarettes, 20 to 30 per cent were able to give up smoking completely. He also said that after trying their heated tobacco products 80 per cent stopped smoking. According to recent figures, there are 9.4million smokers in the UK and 100,000 of them die every year. Statistics also show that one in 10 mothers have admitted smoking well into their pregnancy. GMB’s Piers also quizzed Mr Nixon on why Philip Morris spends £94million on TV advertising in Indonesia, where youngsters are also targeted.